My Journey to Fit: FMM: Universal Studios - Pictures and Rides! 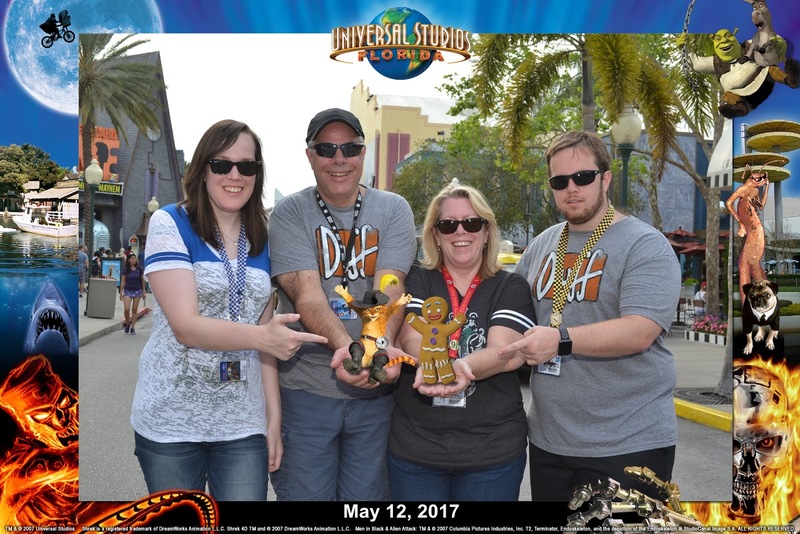 FMM: Universal Studios - Pictures and Rides! At the entrance to Universal Studios. At the entrance to Islands of Adventure. Other view at Islands - Sam was off checking out Express Pass pricing when we took this one. Magically holding Puss in Boots and the Gingerbread man. 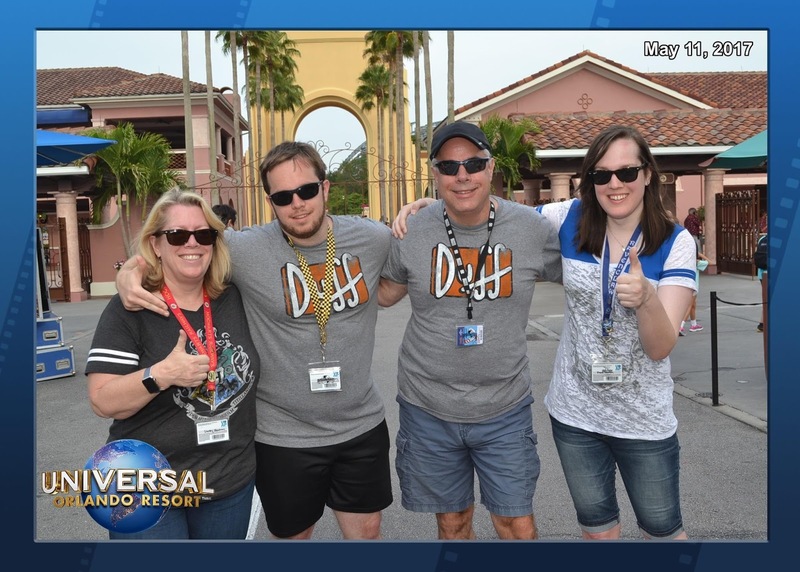 We planned this and actually pulled it off on the first try - even the guy at the picture place was impressed! This was on the Forbidden Journey ride, which is my favorite of all the rides there. 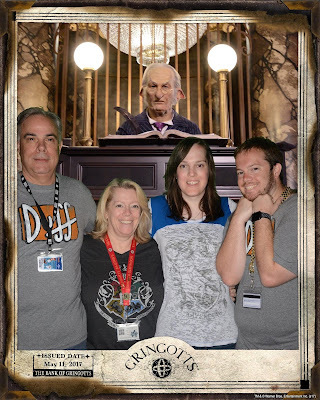 Sometimes they will pull you aside for a picture while in line for the Escape from Gringotts ride - and with Sam in the shot, you never know what shenanigans will happen. 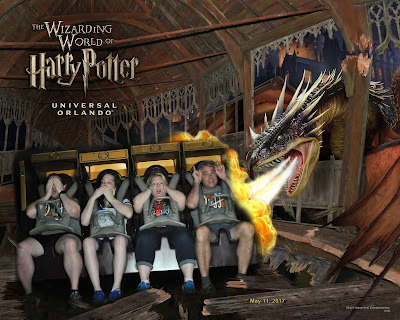 Sam again with his shenanigans - it wasn't THAT scary, LOL. 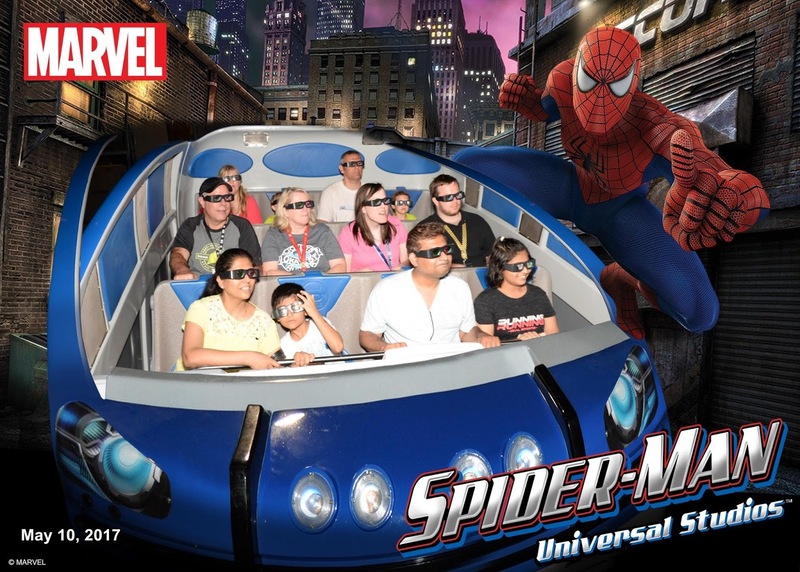 Spiderman was a good ride but the spot where they take the picture wasn't particularly scary, hence the lack of reaction on everyone's faces. Wearing 3D glasses - don't we look cool? This is truly the faces of fear and trying not to die - you can even see their white knuckles! 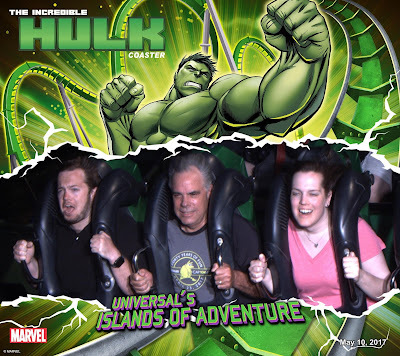 The Hulk ride bashes your head around, which is why I won't go on it...I need what's left of my brain cells, thank you very much. ...and here's where you can see who the real daredevil is in our family. With the exception of the Hulk ride, we went on every ride multiple times over the week that we were there. On the day we did the water rides, we wore bathing suits and/or lightweight technical clothing, plus we brought flip flops and changed into them once we walked to the rides, which turned out to be an excellent idea as we were completely soaked; it was a hot day, so getting wet felt great. One ride where they don't take your picture is Popeye's Bilge-Rat Barges, which is a circular raft that seats 12 people - this one soaks you completely, with water gushing in around your feet and from above. There was no line for this one, so we were able to stay on and ride again three times - each with a new group of people, and it was hilarious to see their reactions as the ride went under the first waterfall. The other fun thing that we did was to squirt unsuspecting riders of the water rides with the water canons on the bridges - each squirt cost a token, and apparently we did that so often that Sam's credit card company called him to verify the charges, LOL. Why yes, he did spend $5 for a handful of tokens multiple times - totally worth it. We were expecting to get karmic retribution when we finally went on those rides, but only got squirted a few times. There are only a few rides that we collectively agreed are clunkers - E.T., which is incredibly dated and boring, Minions - but that could be because none of us are into the Minions, and Race Through New York starring Jimmy Fallon - for a new ride with all of the technology, it was just meh for us. 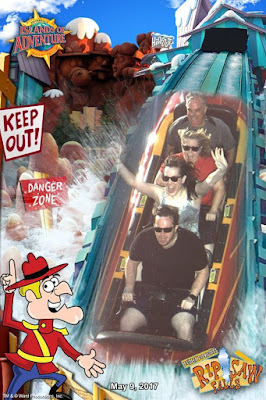 We didn't go on any of the Dr. Seuss rides, but Jeff and I did when we went there several years ago - they're fine if you have younger children or are not a fan of the more thrilling rides. When we were on Dr. Doom's Fearfall, we happened to see Dr. Doom himself walking into the park (we were high up in the air) and started yelling "DR. DOOM, DR. DOOM!!" He looked up and waved to us, which was pretty cool. 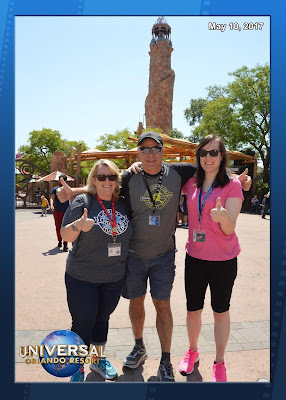 What can I say - when you're at a theme park, you can act like a kid and get away with it! 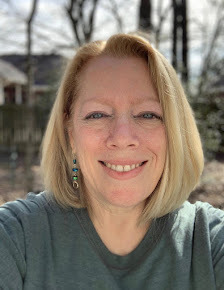 Have a great weekend - it's a long one for those of us in the United States; we plan on getting in some grilling along with some hammock time, plus Allie will be home! I'm taking Memorial Day Monday off from blogging so I'll see you back here on Wednesday. What a great gift! So nice because YOU get to be in the photos instead of the one taking them. Looks like you guys really had a blast. Its so fun to see how much fun your family has together! Oh! Somehow I missed the first sentence--how your kids got you the picture package. No wonder you got such great photos! how fun. I love the parks esp Universal but I'm not big on those scary rides. I leave them to the hubs & stepsons. Great idea about the photo package. I am the photographer all the time which makes it hard to be in the pics. Great pictures! 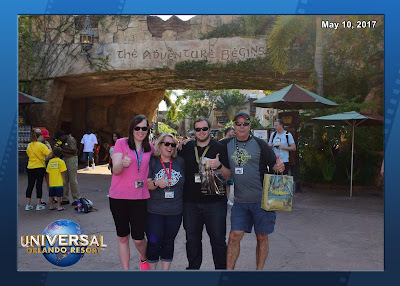 We haven't visited Universal in a several years but we loved all the rides. The scariest one to me was the red Rockit coaster that went straight up! I could not ride HPFJ multiple times in a row. It made me nauseous -- and that's not like me at all! All of those photos are really neat! Love them! Also, squirting runners from the bridge sounds like fun - too funny the CC company called! What a great gift! I am totally LOLing at Sam's face! That sounds like a great plan for the water rides. I need to remember to do that the next time I got to an amusement park. I live right next to a Six Flags and want to take my nephews! What a blast!!!! Love the ride pics!!!! I am dying - those photos are great!! How fun are these! It's been a long time since I've been to an amusement park--Disney was just starting to do pics when we were there. What a great gift! I always like having pictures instead of souvenirs, your kadults did good! Now I actually would have liked to seen a photo from that Popeye ride! Your kadults do know you well!!! What a fantasic gift and it looks like a fantastic week!!!! Finally some time to catch up on blogs. Love all the photos. There's so much joy and happiness in them.